Would you like to visit AUBG for a semester or two and return to your home university? AUBG welcomes exchange students and appreciates their contribution to the diversity on campus. 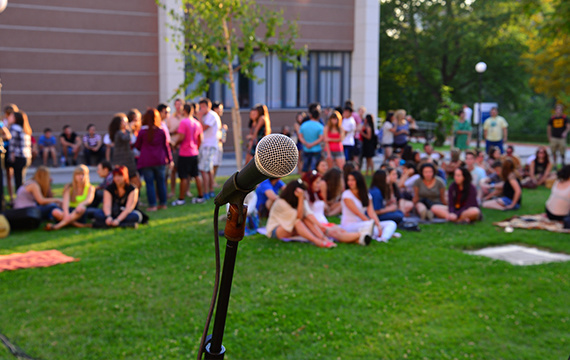 If your home institution is affiliated with AUBG directly of through a consortium (e.g. Erasmus or ISEP), you should apply through your university's Study Abroad or International Programs Office. Please follow the link to complete your Online Application. Transfer applicants should ordinarily have a CGPA of 3.0 or better on a 4.0 scale (or the equivalent) in their previous university-level courses. Students with less than a 3.0 may apply and will be reviewed on a case by case basis. Applying students must present an official transcript issued from the University they are currently enrolled in. If you are not a native speaker of English, you will need to present English Proficiency Certificate(min. B2 level). The English Proficiency requirement may be waived for residents of the United States, the United Kingdom, Ireland, Australia, New Zealand and Canada. 3. Maximum of 60 hours of credit from accredited institutions or institutions recognized by the Ministry of Education.